Following the loss of a full row of teeth, your confidence will be adversely impacted as much as your smile’s function. In the past, smiles would only be restored using removable dentures. These dentures only return about 20% of healthy function, limiting the patient’s ability to consume a nutritious diet. An implant supported denture requires a significant amount of healthy gum and bone tissue to ensure the implants will attach, recreating the supportive root structures. In many cases, patients needed advanced preparatory bone or tissue grafts prior to these treatments. 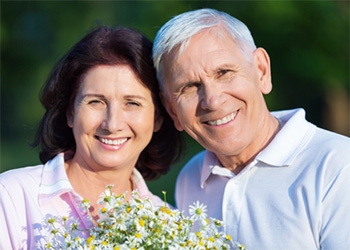 All-on-4 dentures utilize the naturally denser portions of the jawbone to provide support. This means you get all the benefits of an implant supported denture without the need to undergo lengthy, complex preparatory treatments. 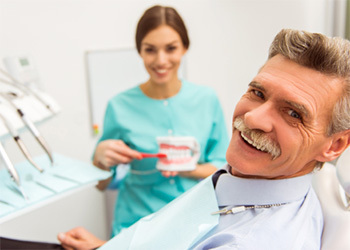 If you want to find out more about All-on-4 dentures or any of our other advanced restoration options, contact the South Windsor Dental office team to schedule your tooth replacement consultation in our office. We look forward to helping you seamlessly recreate your healthy smile. All-on-4 is a unique dental implant supported denture treatment plan that allows us to utilize the denser portions of the jawbone to provide support for the whole denture. For this reason, patients are often able to have a full implant-retained denture without the need for advanced preparatory treatments like tissue grafting. 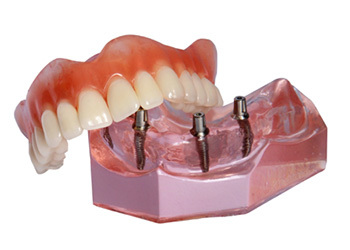 The key to All-on-4 dentures is the unique placement method we use. Two dental implants are placed vertically to support the front of the denture. Then, two implants are placed diagonally from the back of the denture to the front. This utilizes the naturally denser portion of the jawbone in the front of the mouth to support the whole denture without the need for advanced preparatory bone and gum tissue grafts. The All-on-4 method allows more patients to receive successful implant supported denture placement. In many cases, we can attach a temporary denture on the same day that your dental implants are placed. The unique positioning of All-on-4 dental implants allows many patients to complete this treatment without the need for preparatory bone or gum tissue grafts. Unlike removable dentures, that only repair about 20% of chewing function, All-on-4 prosthetics restore 70% or more, allowing you to consume a variety of healthy foods. Traditional dentures need to be replaced every five to ten years, but All-on-4 dentures can last two decades or longer with proper care.